TheHob.org: Win ?The Hunger Games? signed by Jennifer Lawrence! TheHob.org: As we get closer to the release of The Hunger Games movie, we?re thrilled to see the fandom grow in size as more and more people are introduced to the amazing series. So much so that we?ve recently surpassed two milestones of our own ? 4,000 ?likes? on Facebook and 10,000 followers on Twitter! Which all seems like a cause for celebration. 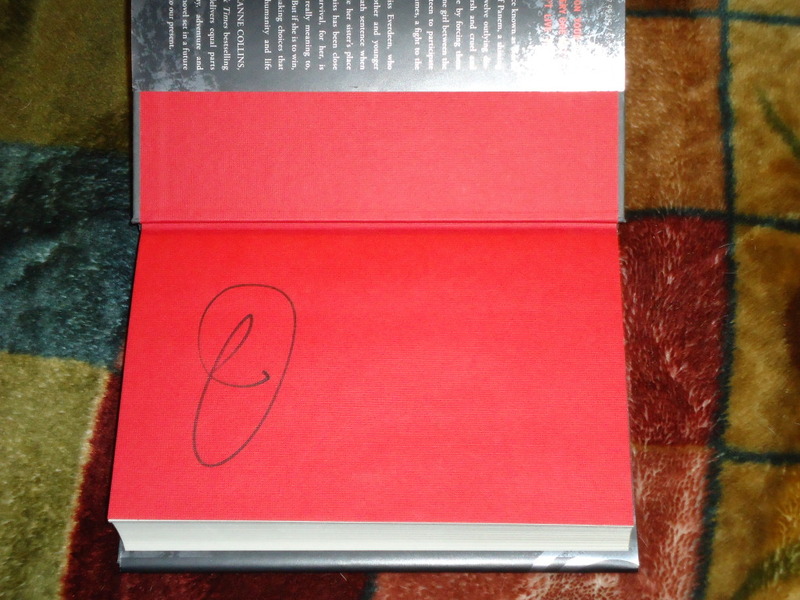 When we met Jennifer Lawrence while she was in NYC doing promotion for X-Men: First Class, we were able to snag her signature on two copies of The Hunger Games. We gave one away to our readers?back in June, and now?s the time for us to giveaway the second copy! Once you?ve done any combination of those three things,?FILL OUT THIS FORM?and you?re entered! ?This contest is open to international fans and?ends this Friday,?February?24 at 10:00 PM ET. We?ll then use random.org to choose a winner. Good luck! Now we can add another event to Jennifer’s list! Are there any French fans here? Listen up! Premiere of The Hunger Games in Paris was announced this morning and we know that it has its place on Tuesday, March 15th at Gaumont Champs-?lys?es Marignan at 8.30PM. What’s more, the cast of the movie — Jennifer Lawrence, Liam Hemsworth, Josh Hutcherson and the director Gary Ross are expected to attend the event! You can book your tickets this Saturday, February 18 at the Gaumont Champs-Elys?es Marignan cinema in Paris. Join the forum and win X-Men: First Class, The Beaver & Winter’s Bone on DVD or Bluray for free! Hello everybody, today I have great news! Josh, admin of Jennifer-Lawrence.com set up a forum, so now everybody can join and talk to other Jennifer fans about our idol. In my opinion, that’s really great, it would be nice to meet others who love Jen as much as we do! :) Don’t forget to tell your friends about it — more users = more interesting topics! We hope that the forum become one of the best and biggest places to discuss and chatting about Jennifer, so I really encourage you to join it. How do you win a free copy of a Jennifer Lawrence movie for yourself? It’s SUPER-EASY, just use the forums! For each post made by members they will get 1 entry towards the giveaway. Please be sure to remember that the posts must be real, no spamming allowed! This forum-posting contest will end November 30th, 2011 just in time to get the Jennifer Lawrence Movie to your house before Christmas! 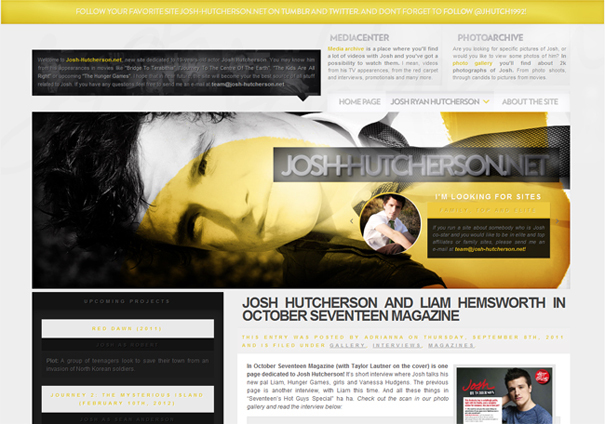 I know that is not closely related to Jennifer, but my sister has just opened new Josh Hutcherson fansite. Josh is an American actor who you may know from his appearances in movies like “Bridge To Terabithia”, “Journey To The Centre Of The Earth”, “The Kids Are All Right” or upcoming “The Hunger Games”. So if you’re fan of Josh, I encourage you to visit Josh-Hutcherson.net. Hello everybody, I’m pleased to announce that the site is nominated for ‘Site Of The Month’ award on polish Ashley Tisdale fansite! I know that there are many Jennifer Lawrence fans, so I would like to ask you for little help :) Could you vote for JenniferLawrence.org in the poll below? It’s out first nomination, that’s why it’s so important! Wybierz najlepszy fansite ‘wrzesnia 2011’! Thanks in advance! :) Little ad of the site on AshTisdale.pl could really help in promotion, and what’s more, if we win, more fans of Jennifer will visit the site. It would be great! I believe that we have POWER, so vote!